‘Beauty in Thorns’ by Sir Edward Coley Burne Jones, 1870. ‘A large hedge of thorns soon grew round the palace, and every year it became higher and thicker; till at last the old palace was surrounded and hidden, so that not even the roof or the chimneys could be seen. But there went a report through all the land of the beautiful sleeping Briar Rose (for so the king’s daughter was called): so that, from time to time, several kings’ sons came, and tried to break through the thicket into the palace. ‘After many, many years there came a king’s son into that land: and an old man told him the story of the thicket of thorns; and how a beautiful palace stood behind it, and how a wonderful princess, called Briar Rose, lay in it asleep, with all her court. He told, too, how he had heard from his grandfather that many, many princes had come, and had tried to break through the thicket, but that they had all stuck fast in it, and died. Then the young prince said, ’All this shall not frighten me; I will go and see this Briar Rose.’ The old man tried to hinder him, but he was bent upon going. ‘Now that very day the hundred years were ended; and as the prince came to the thicket he saw nothing but beautiful flowering shrubs, through which he went with ease …. And all was so still that he could hear every breath he drew; till at last he came to the old tower, and opened the door of the little room in which Briar Rose was; and there she lay, fast asleep on a couch by the window.’ (Princess Briar Rose, Brothers Grimm). 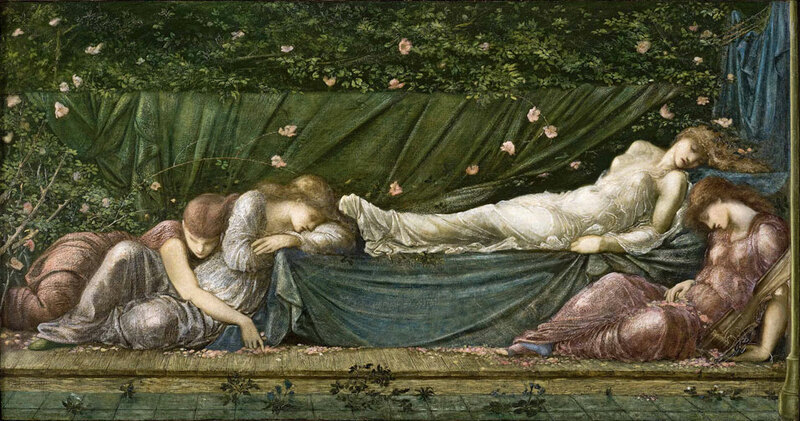 Church High Princesses: ‘asleep’ on the wall by the window. I have always loved fairytales and ‘Sleeping Beauty’ is one of my all time favourites. As I’ve said before, there turned out to be many advantages to being denied access to the building work in June last year. Had that not happened, I wouldn’t have been forced back onto my own initiative and these beautiful, evocative photographs of Tankerville House and No 1, Haldane would never have been taken on that sunny evening walk along Tankerville Terrace on June 9th. 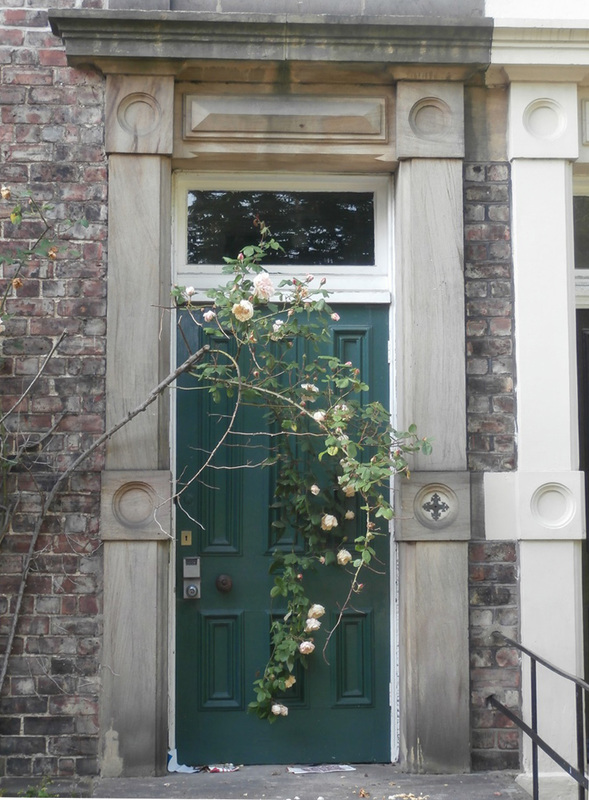 It’s true my ‘inner child’ is never far away at the best of times, but Tankerville House, dappled by low evening sunlight with its doors and windows half-hidden by overgrown roses and greenery, seemed to call to me that day: “Come over here! Don’t forget about us. Things this side of the road are exactly as they were. We are merely sleeping.” And it was true, of course. As everything was turning white in the Main Building, all was still green here. 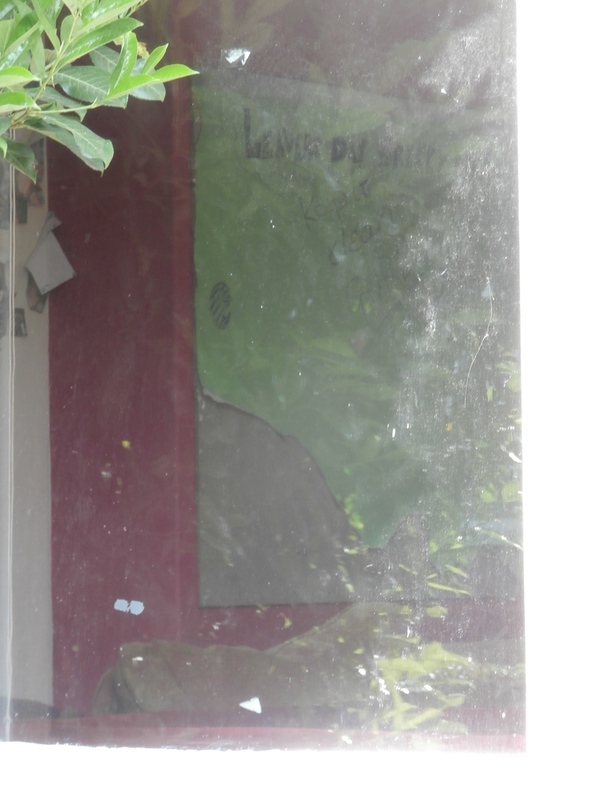 Indeed, peering through the windows, everything was just as it was left in July 2014. 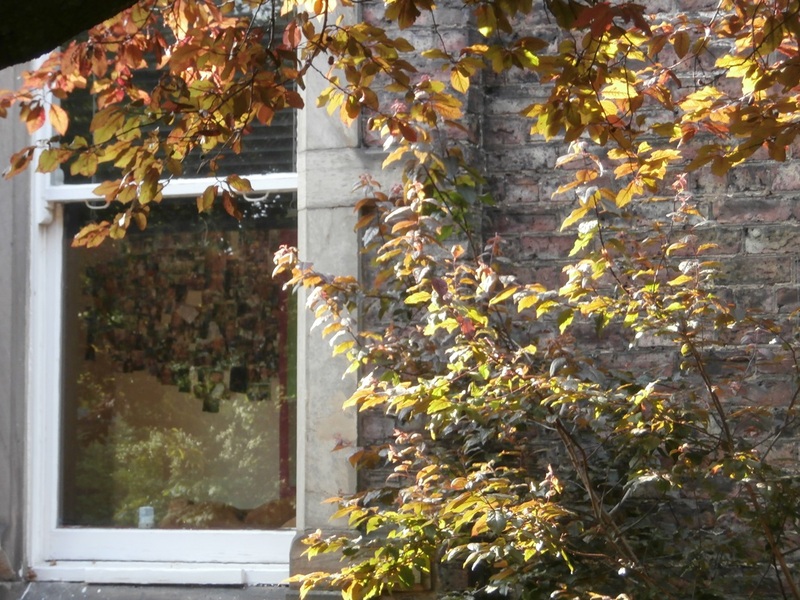 Through the Sixth Form Common Room window, the 2014 Leaver’s Day ‘battle plans’ were still there to be seen on the wall. Miss Gurney’s bookcases in the Sixth Form Room, which you may recognise from the fireplace as Computer Room 2. 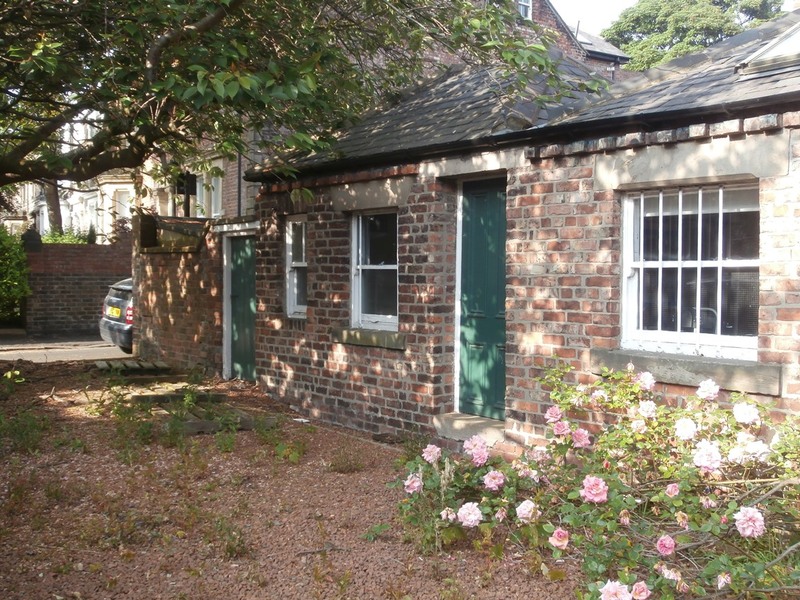 The Junior School had previously been based further up Tankerville Terrace in Henshelwood House. In 1927, Miss Gurney now made this her home address after having given up the lease on The Grove. 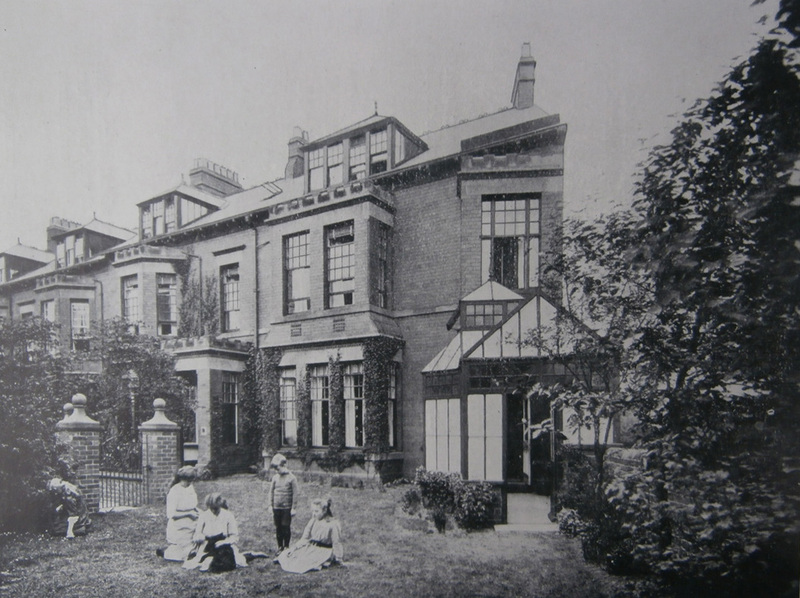 Henshelwood House, the original home of the Junior School: later Miss Gurney’s home (Church High School Prospectus). 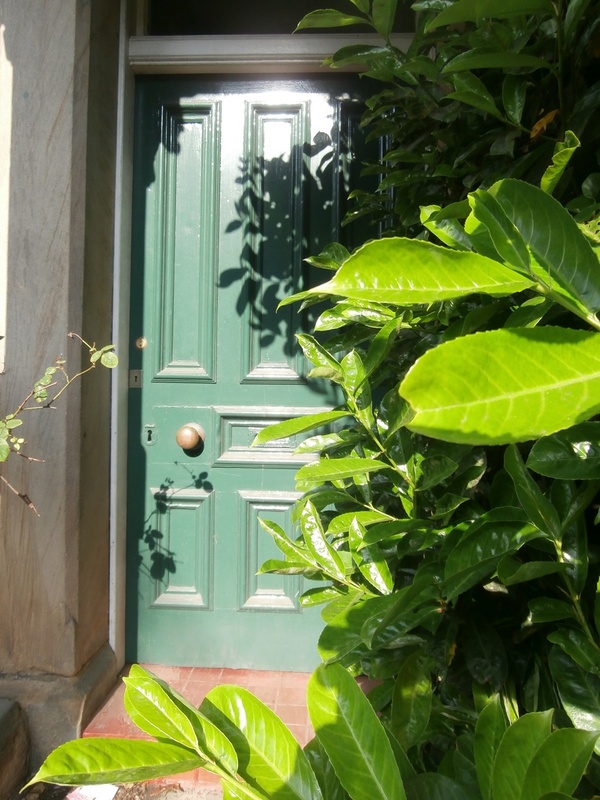 That afternoon in sunny June, Sleeping Beauty came immediately to mind as I stood in the gateway of Tankerville House because of the overgrowth of greenery – especially the big bush by the door. I can’t say I was ever aware of it being pruned, but it must have been. 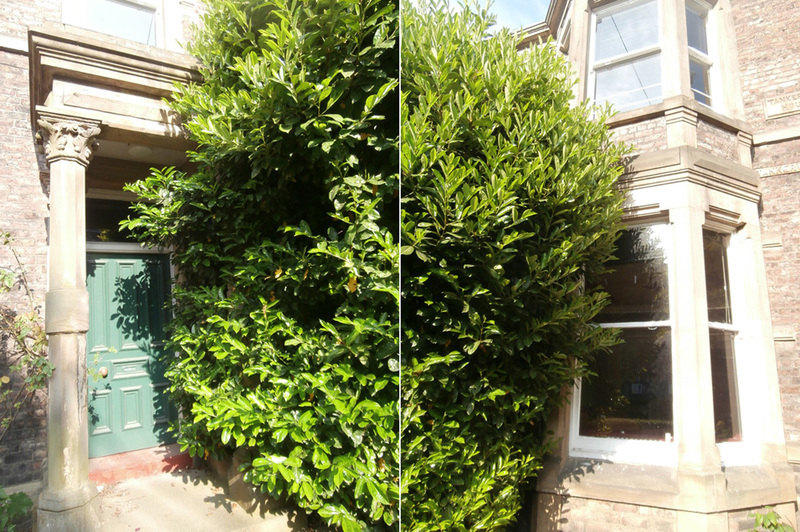 The bush was now encroaching on both doorway & window. There was a decidedly romantic fairytale feel to the place as I approached the sun-warmed stone of the pillared portico doorway. 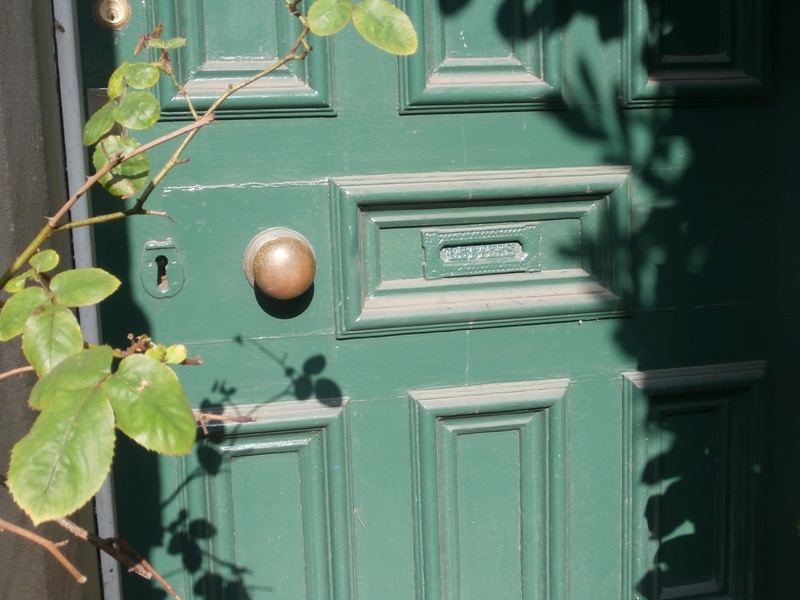 Even now, as I look at the photograph below, I can easily recall the pungent smell of heated gloss paint on that old, familiar green door. The building we all remember as the Church High Sixth Form Block did not just consist of Tankerville House, of course. 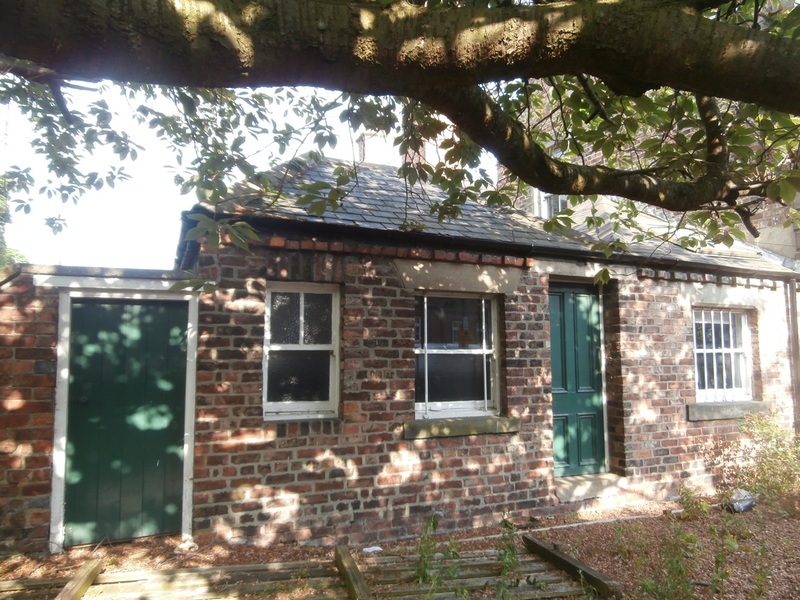 Behind it was also No.1, Haldane Terrace, purchased in 1944 when the School returned to Newcastle from Alnwick Castle after World War Two. Sleepy 1, Haldane Terrace, June 9th 2016. Even before I stepped foot into the gateway of 1, Haldane Terrace, that Sleeping Beauty feeling was there again, but this time even stronger. 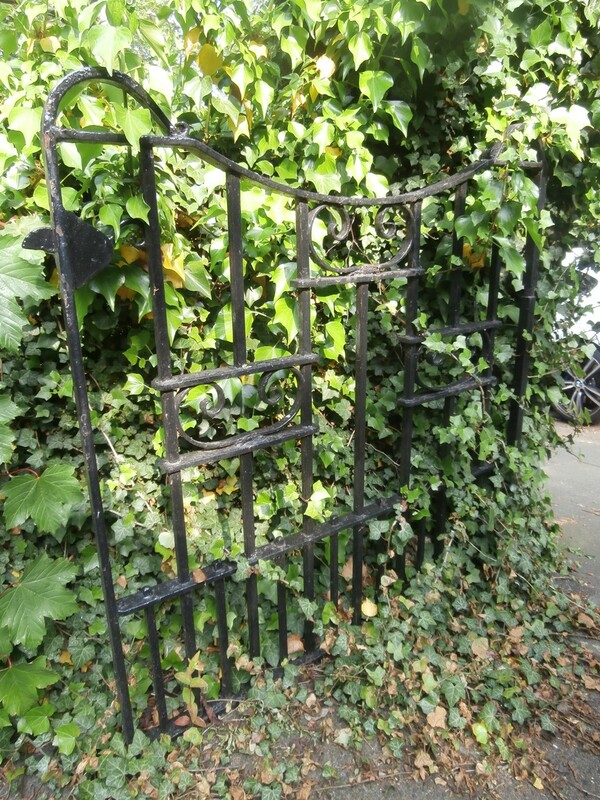 There was no mistaking the fact that the wrought iron gate, tight in the grip of ivy, hadn’t been moved for a very long time. 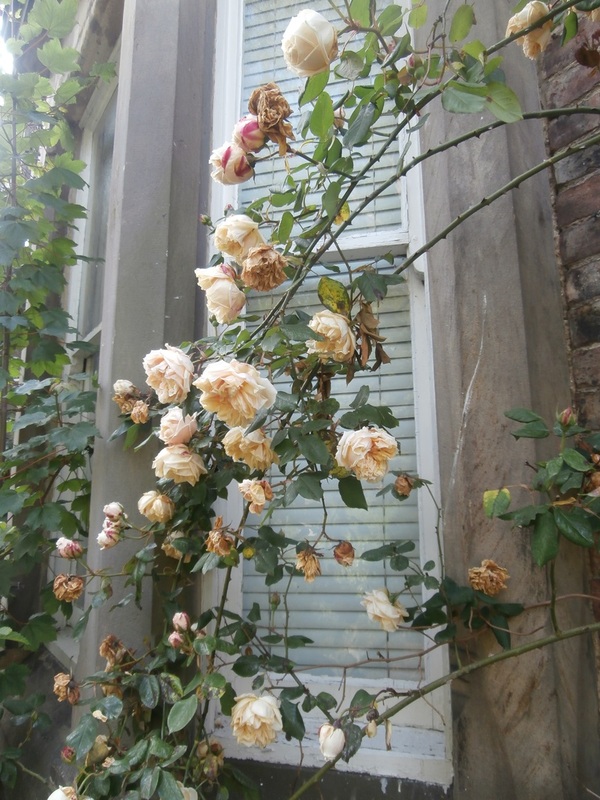 And those rose-covered, mullioned windows with the blinds tightly-shut. We truly were in the realm of ‘The Legend of Briar Rose’ now. It was the side doorway that most caught my imagination though. Whilst always poignant to see evidence of a doorway one used to use taken over by Nature through of lack of use, on this occasion it was a particularly beautiful sight. 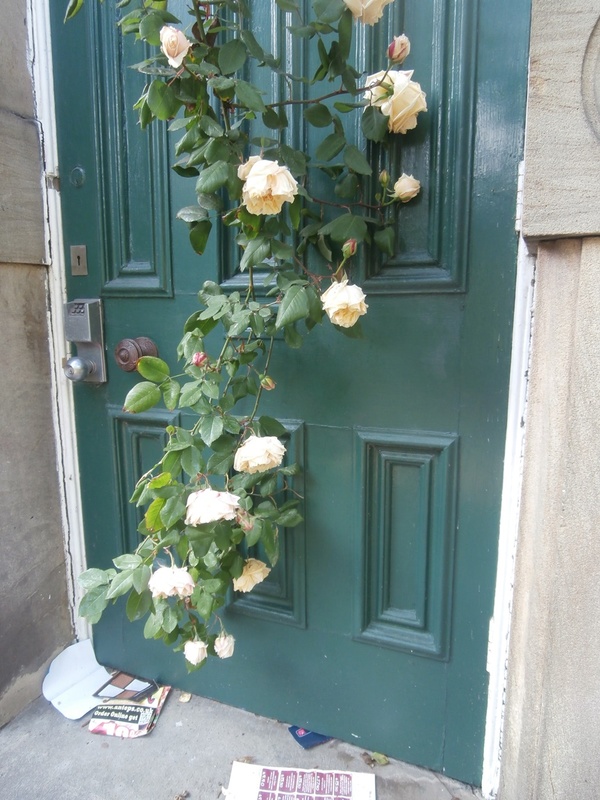 The white briar roses grown across the big green door appeared more to be shielding something precious from intruders rather than speaking of neglect and decay. 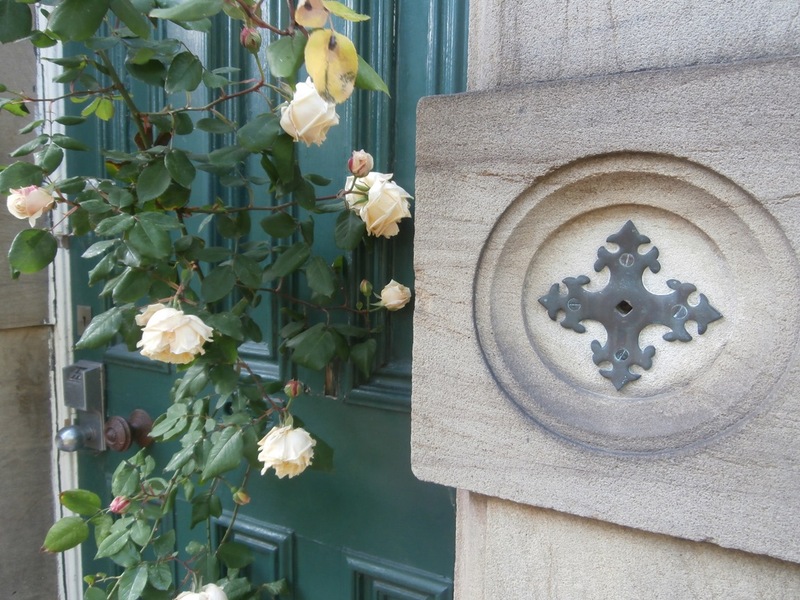 Sleep On: no-one has rung this doorbell for a very long time. Which brings me to The Lilac Fairy. 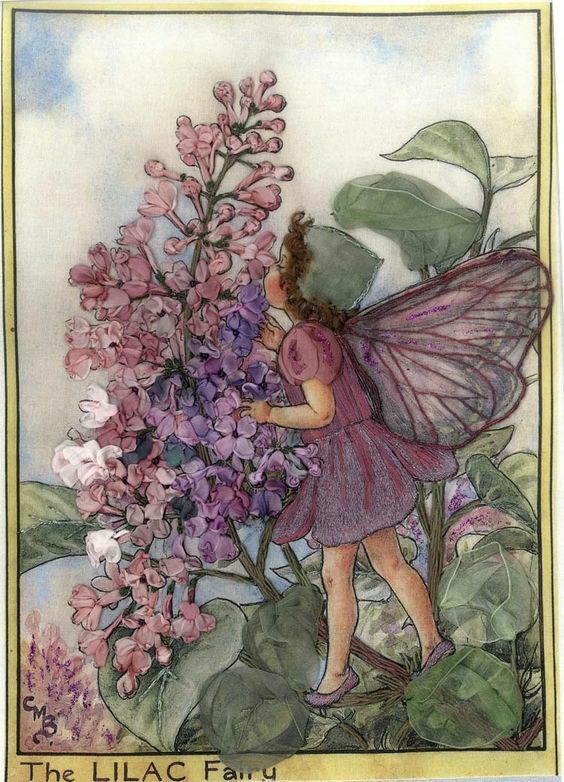 When I was a little girl, I was entranced by the large lilac tree at the bottom of my Nana and Grandad’s garden. Its thick blossom always smelled intoxicating. And, if you know your Sleeping Beauty Ballet well, then you will know that The Lilac Fairy is capable of making some very strong magic indeed. In Tchaikovsky’s ballet, the battle between Good and Evil is represented in the clash between two characters: The Lilac Fairy and Carabosse. It is Carabosse who gifts the curse of death to Princess Aurora and The Lilac Fairy who softens it to sleep. 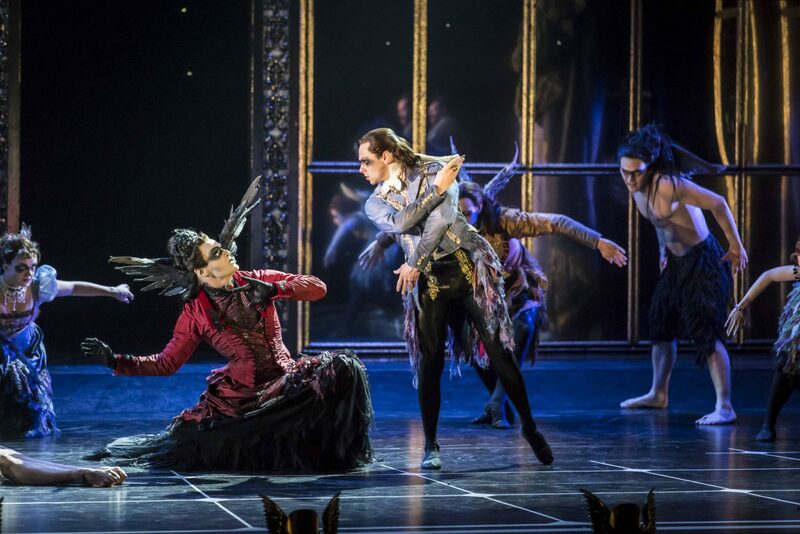 In Matthew Bourne’s 2012 Gothic interpretation, The Lilac Count rules the day. The Lilac Count defeats Carabosse in Bourne’s production. If I ever needed reminding that Good always overcomes Evil or that when you put a teaspoon of red jam in the middle of a bowl of milk-white rice pudding, the whole thing will go pink – which I don’t – I now have a little Tankerville ‘Briar Rose’ memento to make sure I don’t forget. 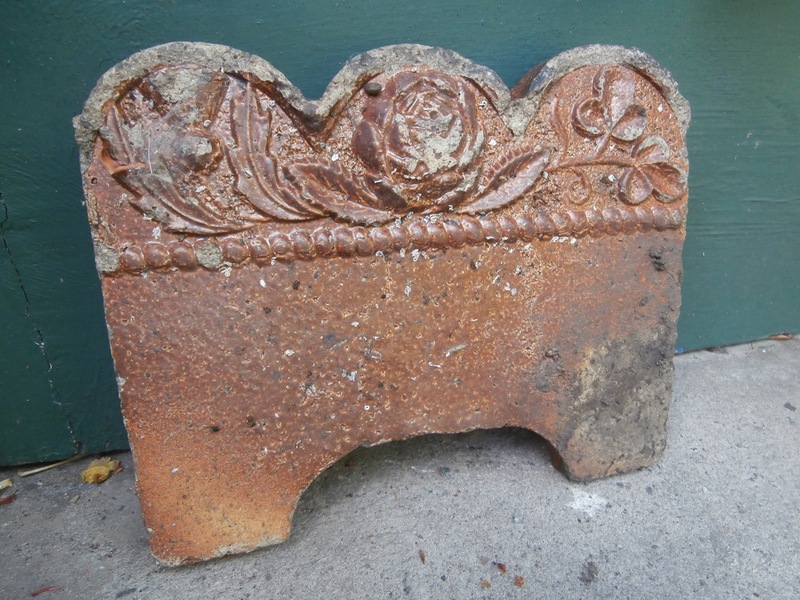 I found an old chimney tile discarded among the rose-bushes that day. Forgotten things often have a way of coming back. I enjoy ALL your blogs, Christine, but this one really was utterly enchanting: pure magic, in fact! Also a fan of Flower Fairies, so loved above. Magical door + foliage images. I’ve really enjoyed reading that! 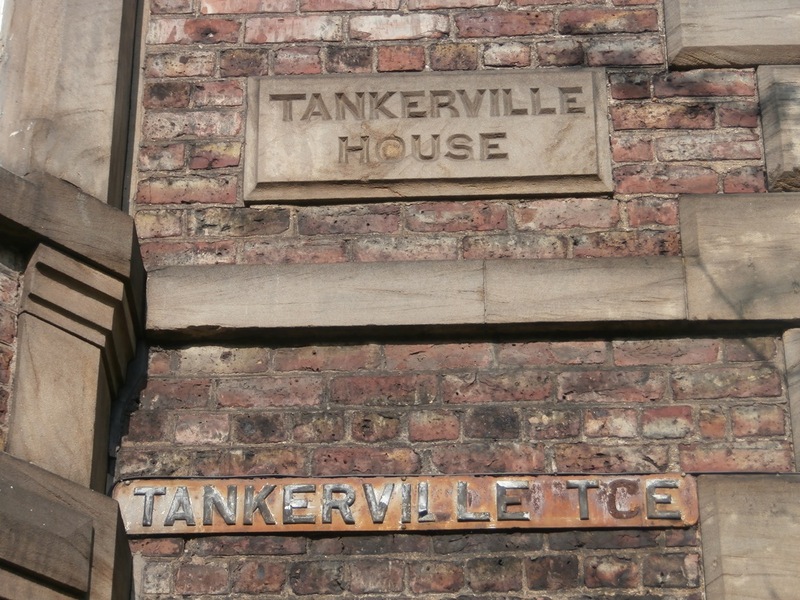 So many happy memories of Tankerville House as the Junior School, music and art rooms. 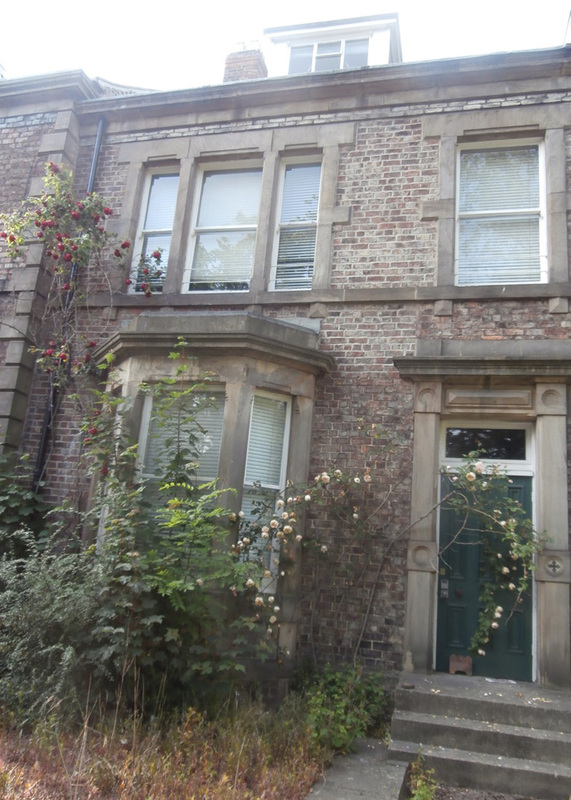 We used to have a little patch of garden which we looked after outside 1 Haldane Terrace. Loved my time spent there. Happy days indeed.